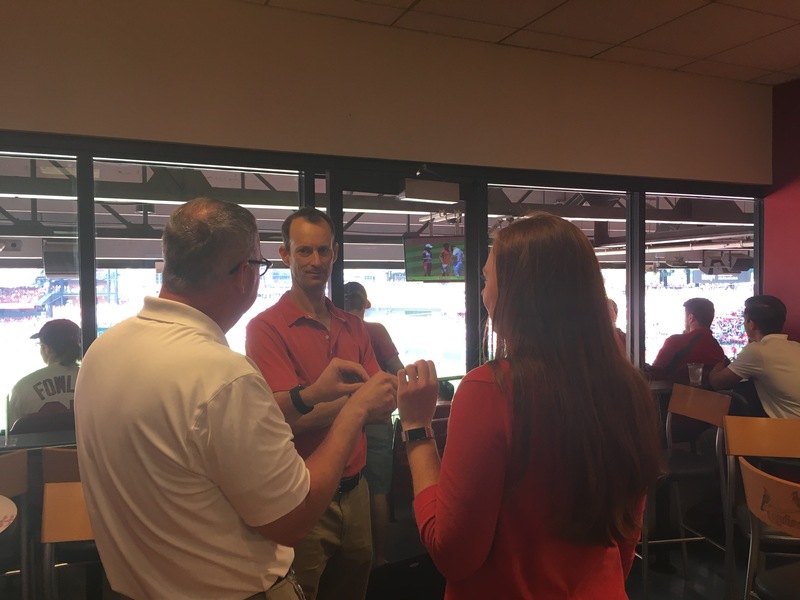 For seven straight years, the Cardinals have hosted the bloggers, allowing Q&A with John Mozeliak and Bill DeWitt III. And for the seventh straight year, everyone there has come away with a similar thought. Man, Mo can be a candid guy. –Carson Kelly could have been up this weekend had Mo known Yadier Molina was going to be out all weekend long. The word he had from the coaching staff was “day-to-day, day-to-day” and it turned into a time where they could have used the 10-day DL. Between that and the next item, it indicated to me that the lines of communication between the front office and the dugout weren’t always as accurate and smooth as we sometimes think they are. –Mo prefers the 13 hitters/12 pitchers roster makeup, but the coaching staff is fairly adamant about the other configuration and he’s about giving them the tools they need. He also said that while the club did have 13 hitters right now, he thought it would probably flip this week with the double-header and stay that way for a while. He also dropped that Marco Gonzales would be pitching in the doubleheader on Tuesday, which none of the group had heard beforehand. –I asked about how they avoid groupthink. 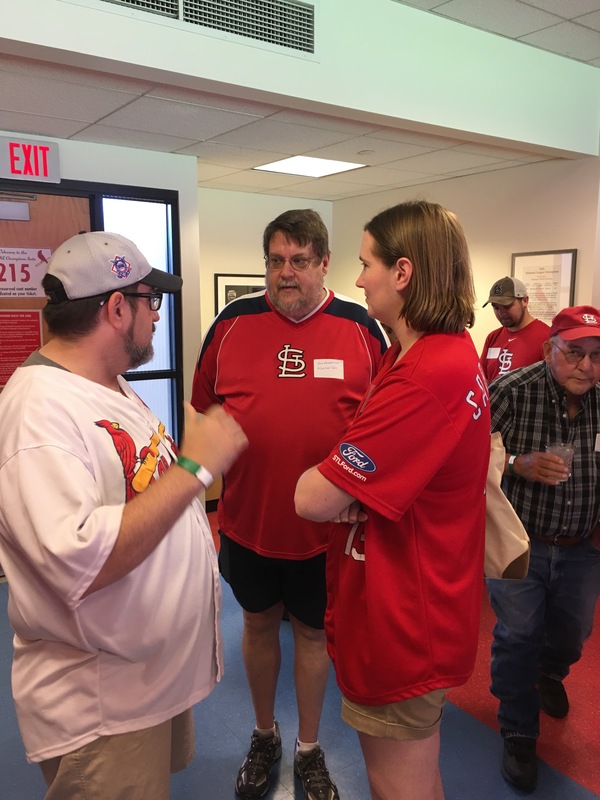 (Starting off my question with “The Cardinals have been successful for 20 years….” Mo interrupted and said “you can write that, you know” as he looked around the room.) He said that they aren’t afraid to challenge people. “I’ve had arguments with Bill’s dad, I’ve had arguments with Mike Matheny.” What I also found very interesting is that they assigned a “devil’s advocate” to any trade or free agent signing they are discussion. One person whose job it is to point out all the reasons that this might not be a good idea. “Then we take a night to sleep on it.” Mo said that he’s even been the devil’s advocate at times. With as much continuity as there has been in the front office and in management, it’s good to have ways to make sure that flaws not only can be found, but discussed. You want everyone on the same page, but you don’t necessarily need every one on the same sentence. –When Kevin Reynolds asked about how he handles social media criticism, he talked about reading us (something that he’s talked about before) and he says that sometimes we don’t get it, but then “sometimes [local writer] doesn’t get it either”. Which is pretty interesting to hear, honestly. We tend to think of the local writers as at least having a pretty strong insight to the front office. (And here I’m referring mainly to the beat writers like Jenifer Langosch and Derrick Goold, because the columnists have their opinions built-in for the most part.) It’s good to know that, for all their access and information, they can still get it completely wrong often as well. –He also was more complementary of the blogosphere than Twitter, which is something that I’ve often said and for some of the same reasons. With a blog, you’ve got to be more thought-out, more supportive of your ideas and thoughts. Twitter’s a great place for reaction and passion, but depth isn’t great in 140 characters. 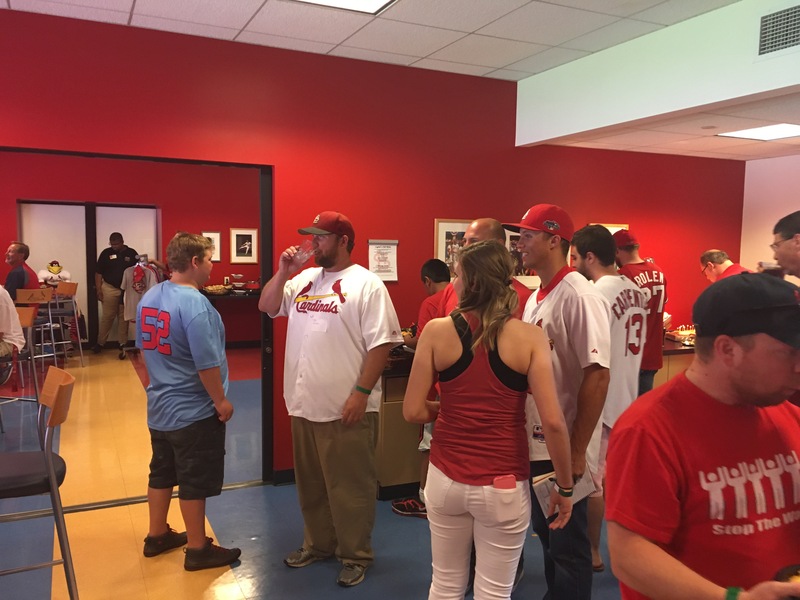 He also gave a shoutout to STL CardGals, saying he’d watched their vlogs and how they’d been depressed lately. It was pretty cool to see him give a real example of what he’d heard and read to back up the claim that he does read our stuff (not saying that he wasn’t telling the truth, of course). Maybe Tara and I have been right all these years when we say he listens to Gateway! —Kyle Reis, of course, asked about Luis Robert and that whole process. Mo said that it was a money issue. “There was a lot of talk about the White Sox recruiting him. We made a video too.” (Ron Watermon chimed in “It was even in Spanish” and Mo off-handedly said he was “0-2 in videos”, which makes me wonder who the other one was. David Price?) It boiled down to the fact that if you are going to spend $50 million on a player, he’s really got to be good. There was a limit they could stomach, but it felt like the White Sox went beyond that. (Which counters some of what I’d heard that the Cardinals had offered more. I imagine Kyle and I will talk about that this week for his Meet Me at Musial segment). He also pointed out that you have to get that value early, because all you are doing is signing the player. He still gets to be arbitration-eligible after three years, etc. 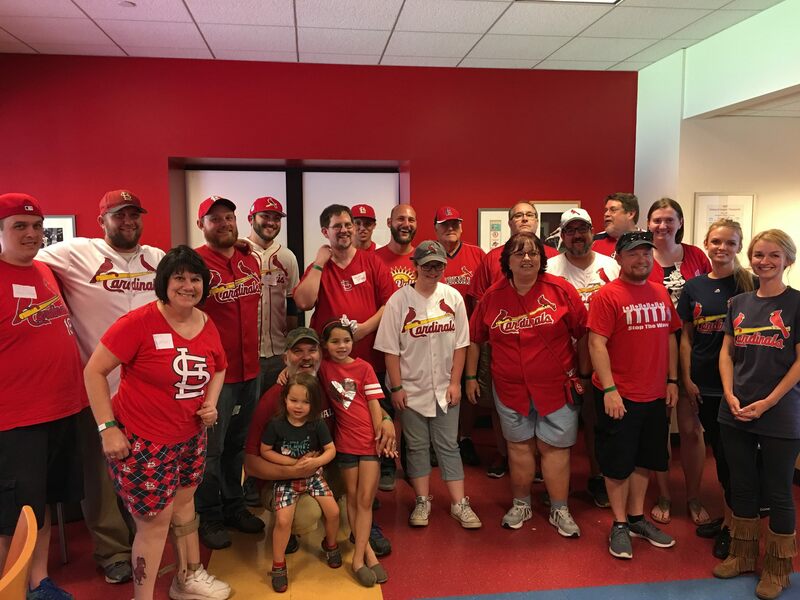 –When talking about the bullpen and its issues this year, Mozeliak said that the biggest factor wasn’t one that many people had talked about. “When Alex Reyes went down, everyone thought that we’d had lost a starter. Alex Reyes was never going to start the season in the rotation. He was always going to begin in the bullpen.” There’s no doubt that power arm would have been a huge help in some of the early games that the club blew. –Mo liked to use the phrase “behind the curtain” in our discussions and the most telling one may have been about the promotion of Magneuris Sierra and how it was really due to Allen Cordoba, the shortstop taken from the Cards by the Padres in the Rule 5 draft. Mozeliak noted that only one other person had been taken from the league that Cordoba had been playing in (the Appalachian League) and they’d been returned, so they felt pretty sure nobody would be taking Cordoba due to that history. “Now we’re the one outlier.” So when he saw that Cordoba had gone from short-season ball to the majors and been successful, he felt he could take Sierra from High A and give him a shot. He did say it was mainly because of his defense and speed, so the hitting was just a nice bonus. He did not say what the plans were for Sierra the rest of the year were, however. There were other things that Mo got into. We started at noon, basically went right to him as Bill DeWitt III was running a bit late, and I imagine he talked and took questions for 35-40 minutes. Finally, he turned it over to BDW3, who spoke more to the business side of things, saying they were in line for 3.3 million right now (which is a bit down from the targeted 3.4, though he didn’t make mention of that) and they have one of the largest season-ticket bases in baseball at 22K. (So before any other tickets are sold, over half the stadium is sold out.) He reiterated how great the fan base was for turning out and making them consistently in the top 5 in MLB in attendance in the 24th largest market. He also thought how awful the team looked (sartorially) out in Colorado with the camo uniforms, topped by a red batting helmet. BDW3 has always been big on the fashion and look of the game–he was the one with significant input on the alternate jerseys, as well as some of the use of the navy blue caps on the road and various logos throughout the years–and it was interesting to hear him say that. Of course, as I found out when I asked, all the proceeds of those jerseys (and the other special ones like Mother’s Day, etc.) go to charities relating to the day, so he can’t do too much about it without looking like the big bad guy. I believe it was Zach who asked him about valuations of the teams and how much they paid attention to it. He said if they were selling, they would pay attention more, but they are in this for the long haul and don’t really worry much about it. He did say they were “trophy assets” and said he thought value over cash flow might be overstated–“infinitely in Miami”, one of a couple of times he threw a little shade toward the Marlins. He also talked about improvements at the ballpark and that every year they have in the budget around $10 million to upgrade and refurbish the park. As he said, they aren’t going to be the Braves and look for a new stadium 20 years after opening. They’ve got Ballpark Village Phase I up, Phase II about to kick off, and Phase III in plans “and it doesn’t make sense to do all that, then move the ballpark.” He said they hoped to hit the sweet spot between the Wrigley Field of five or so years ago, when there was nothing but the game, and some other parks where there’s all these bells and whistles and everything overshadows the actual game. They are looking at a lot of different things, but referencing a system a couple of teams have put in where you can order concessions from your phone, get a text when they are ready, go to a locker and put in the code, and take out your food (three teams have tried it, two teams are having huge headaches with it) that sometimes it’s better in this area to be second, let others try it out, work out the kinks, see if it’s effective, before jumping in and going full bore. We also heard from one of the chefs and a guy in charge of the food truck. The food in the suites was again wonderful, as it always is. They had the sliders that are new at the ballpark, a hero sandwich which was delightful, a nacho bar, small bratwursts, and great cookies and brownies. They always feed us well up there. 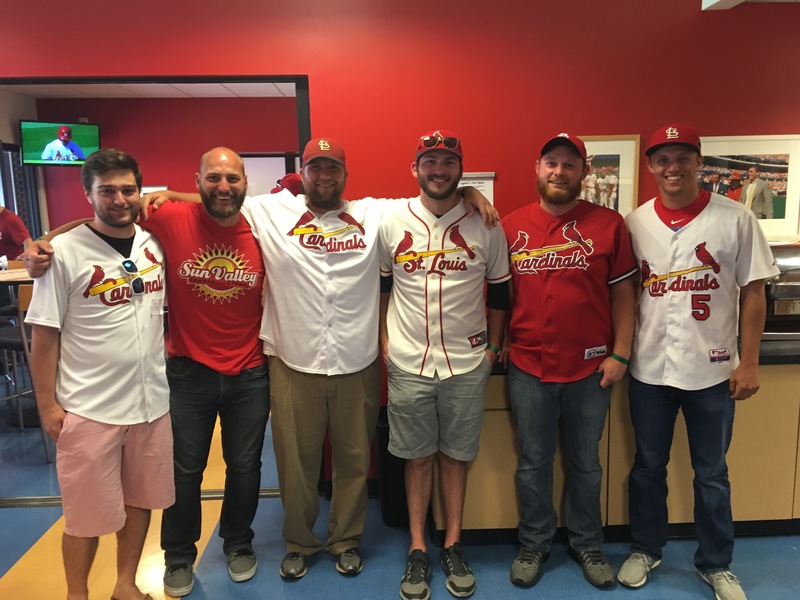 It was a great trip and we can’t thank the Cardinals, especially Marybeth Rea who was our contact and Ron Watermon who heads up that department, John Mozeliak, and Bill DeWitt III enough for their time and candor. It’s nice to know that our focus on the team is appreciated, even in a small way! The 2017 UCB crew. Photo courtesy of Chet Novak (4thebirdz). 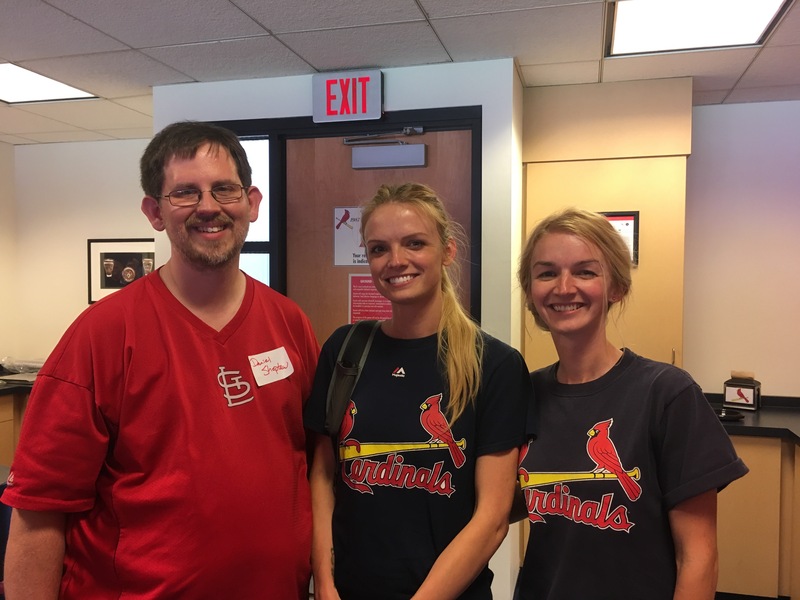 I had to get a picture with our celebrities, Holly and Laura of STL CardGals! 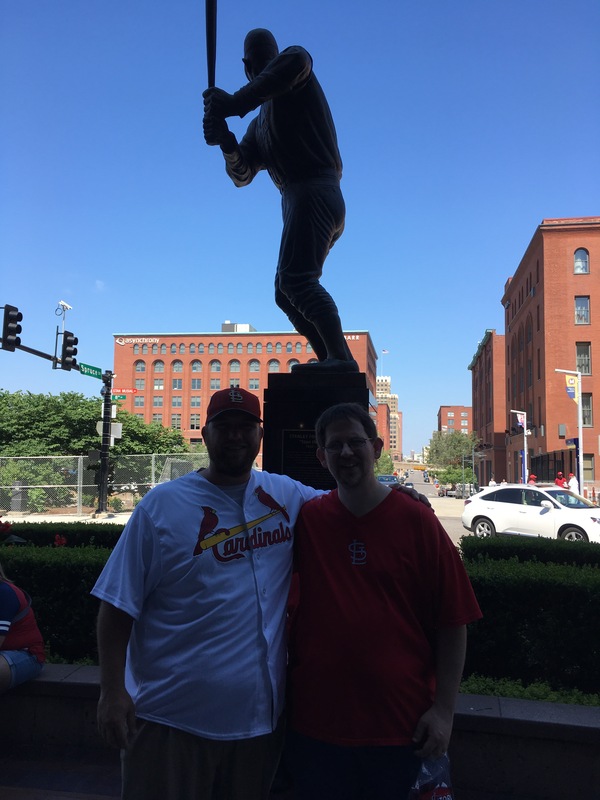 It’s probably safest for you that my Meet Me at Musial cohost Allen Medlock and I are in the shade. We are definitely designed for radio, right Allen? 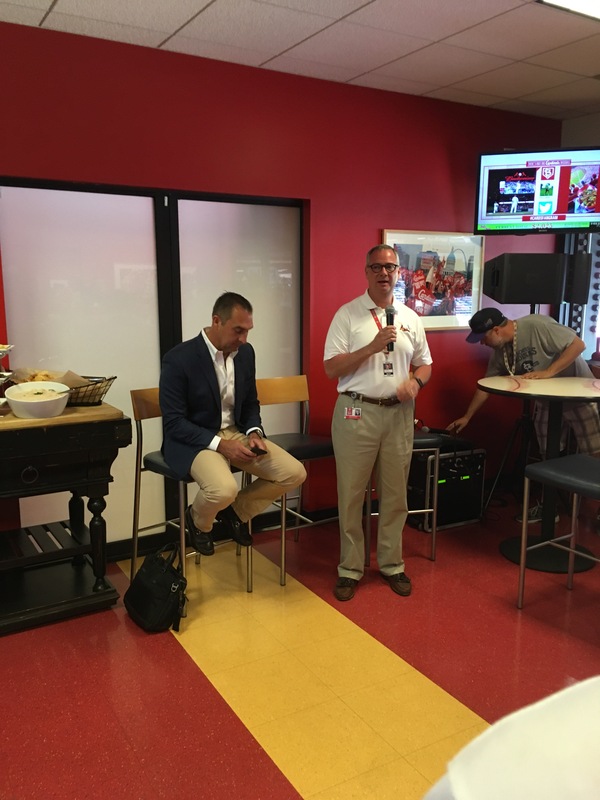 Ron Watermon getting things started with John Mozeliak perhaps bracing for what was to come. Our view from the seats. 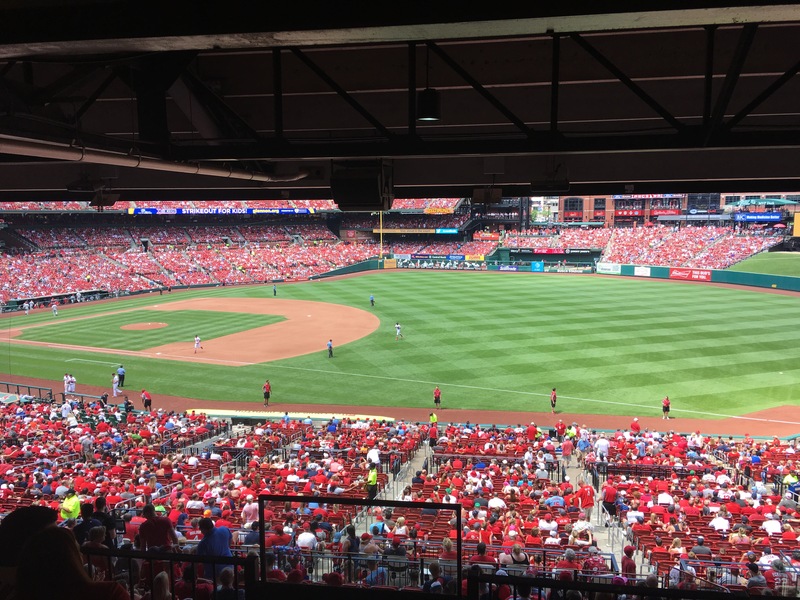 Nothing like the green grass on a sunny afternoon at Busch!